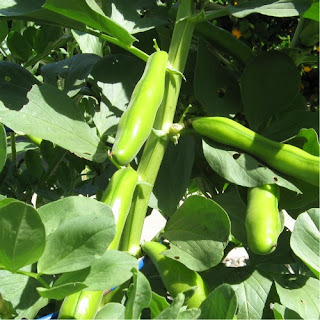 Fava beans are a fantastic cool weather cover crop used to improve soils by many gardeners and farmers. But in my garden we grow them every year to eat them as a spring delicacy. We can hardly wait as we watch the pods getting bigger and bigger as the weather gets warmer. The tender beans are wonderfully buttery - try them boiled for a few minutes, drain them and add a bit of olive oil, a sprinkle of salt and perhaps some lemon juice. My favorite way to eat them is to make a simple but delicious warm salad by adding fresh chopped tarragon from the garden, diced red onion and cooked baby potatoes. That said, our fava crop inspired my husband and I to come up with some tasty but simple ways to enjoy and celebrate our beans. 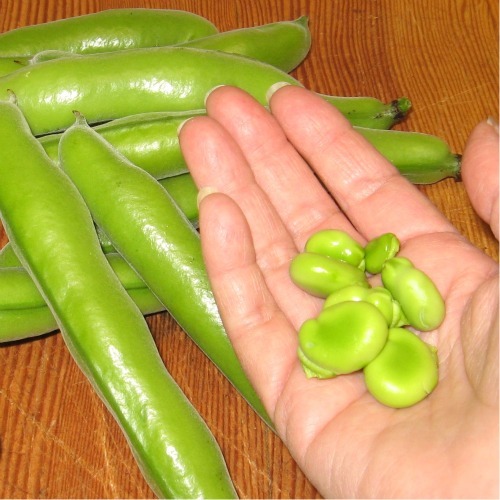 Scroll down past the "how to grow" below to see the recipes form our “fava bean challenge”! Fava plants like cool weather and they do well grown over the winter in our temperate California climate, and they tolerate frost. I plant them in October for edible beans beginning in April. In California they are also planted in early spring for a crop in the summer. The pods are large and the beans swell quickly to eating size after they appear. After harvesting the beans as they mature in waves over a few weeks (about 4-5 weeks), we cut down the stalks and add them to our compost pile for valuable green manure. But we also let a few pods dry on the stalk to use for the next season’s planting. Fava beans are members of the legume family, which are known as “nitrogen fixing” plants, and they don’t require nitrogen fertilizers, in fact they return nitrogen to the soil if you turn the plants under when they flower (the nitrogen is fixed in the nodules developed at the roots). The tall plants can reach 6 feet high and are elegant with white flowers like giant pea flowers with black spots. The flowers are edible, and taste like raw peas (try a few in your salad). Since the plants grow tall and bushy, they provide a lot of biomass to recycle back into your garden through composting. They also attract many types of bees. The amounts in our recipes are approximate; use them as rough guidelines. To cook the fresh beans, add them to the pot when the water begins to boil (just use enough water so they are just covered) and let them simmer for just a few minutes (3 to 5 minutes should fine), then drain them.You are then ready to make any or all of the following dishes below. Note: If the beans are tender I don't bother peeling the skin off of them; if you have large beans that are tough, you may want to spend the time to peel the skin off after cooking them. 4 thin slices of good rustic bread, this is delicious on a hearty bread like Acme's Whole Wheat Walnut. Toast the thin slices of your bread in an oven or toaster. 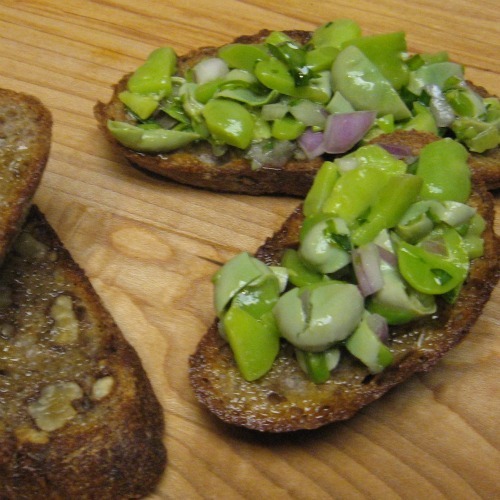 We used our local Acme’s whole wheat walnut bread which was delicious with the favas. After it’s toasted brush with the olive oil and garlic mixture. Put the chopped fava beans, diced onion, and tarragon in a small bowl and drizzle with some olive oil and mix it gently with a spoon. Spoon it onto the bread slices and enjoy! A couple of slices per person makes a great appetizer. Saute the thinly sliced leeks on low heat With olive oil for several minutes until they are very soft, then add the cooked fava beans and sauté for two more minutes. Add about half a cup of vegetable broth or water and use a stick blender to purée the soup. Add more liquid if you would like a thinner soup. Season with salt and pepper to taste. To make the croutons chop thick slices of the bread into squares about an inch across. Posts of these in the oven on a cookie sheet. When you take them out of the up and brushed with olive oil with crushed garlic if you wish. 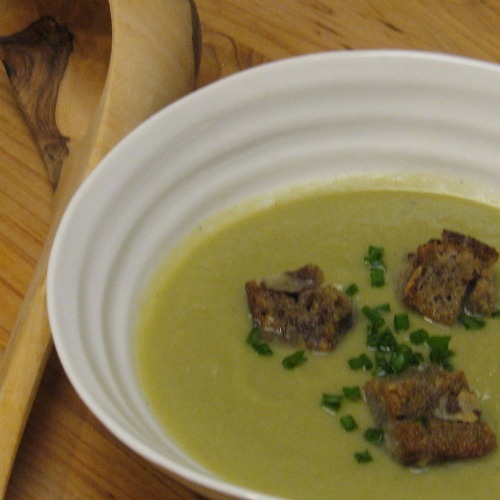 Ladle your soup into bowls, add a few croutons and a dollop of crème fraîche and chopped chives if you like. Puree cooked favas in a hand-cranked food-mill (this is a quick way to remove the skins on the beans). Season with olive oil and salt. Sear the scallops in a hot pan on both sides until almost cooked through. 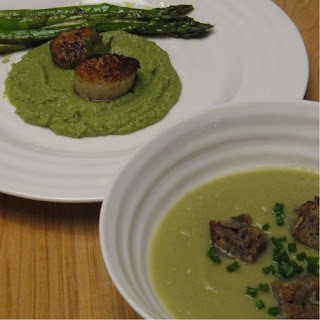 Put a pool of your fava puree on a plate and put the scallops on top. 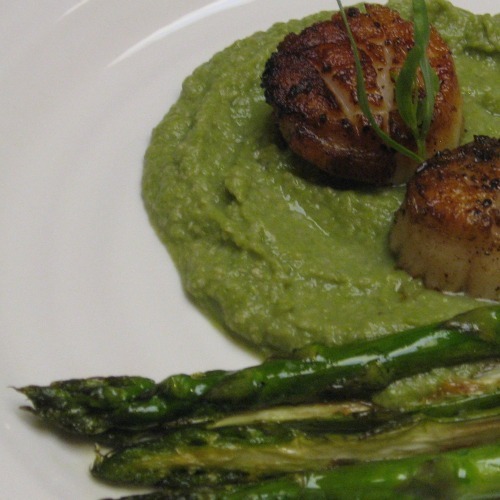 Grilled or sautéed asparagus goes nicely with this and is also a spring vegetable in season! Try planting a few fava bean seeds for a cool weather crop or find them at your local farmer’s market now and relish this special spring delicacy. 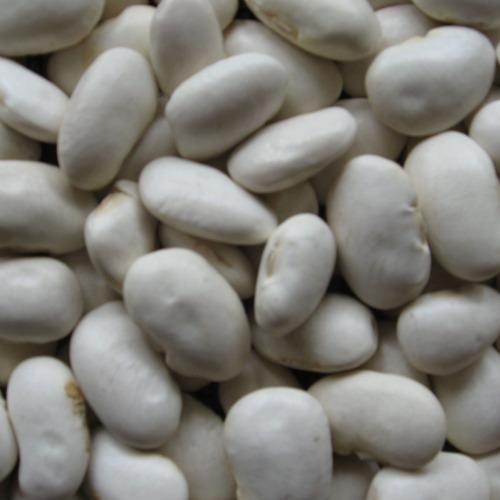 You are probably familiar with pinto, navy, and kidney beans, but there are also scores of amazing unique bean varieties that you may have never heard of. Unless you specifically sought them out, you wouldn't be familiar with the not-so-common beans as you won't find them on your grocery store shelf. These special beans are heirlooms that have been preserved and passed down from generation to generation. Heirloom seeds are often grown in very small quantities, and the seeds are then saved and exchanged with friends and neighbors. 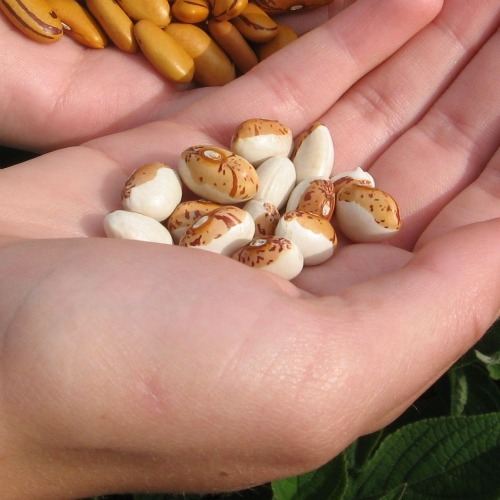 There are a few specialty suppliers from which you could order a handful of select heirloom bean seed packets for propagation; but these are not usually sold in quantities large enough to make a meal. Most large scale corporate farms do not cultivate heirloom legume varieties, intentionally favoring just a very few cultivars; this is why we should grow and save heirlooms seeds, and not let the beautiful plants become extinct. Botanically speaking, common beans are classified as Phaseolus vulgaris, and are native to the Americas. One of these legumes, the Hidatsa Shield Figure bean has been passed down to us through the Hidatsa people of North Dakota, one of the Plains Indian tribes. This bean was grown in the “three sisters” tradition together with corn and squash; the cornstalk provided the pole for this climbing bean, and the squash provided ground cover. ....the choices we have for what we eat are vast and far outnumber what is commonly offered in the supermarket. 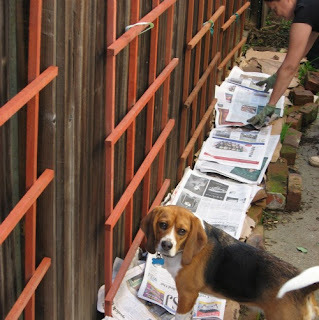 It might seem highly improbable that just a pile of cardboard, newspaper and grass clippings will magically turn into beautiful rich soil, but that is indeed what actually happens. I saw it with my very own eyes. In our quest to find more space to plant vegetables in our ever expanding garden, we did a trial sandwich composting project on the sunny, but weedy side of our house last October. • You don't have to pull up the weeds or other foliage first or dig the soil in anyway, just knock down any plants and leave them in place. It is very important to sprinkle everything with water between layers, and adding topsoil or compost between layers helps speed up the process. Then leave it alone for a few months and let the de-composers go to work. The Scarlet Runner bean has won a very special place in my heart. It is lovely as a trailing ornamental garden plant, and also provides delicious edible pods and beans. Another wonderful quality of runner beans is that they are also a perennial vine, meaning beans will grow all year round in mild climates, and do not have to be resown. In our area (hardiness zone 9) the beans die back with the first frosts of winter, then reemerge in the spring. These legumes are able to do this because runner beans, P. coccineus, are a different species than the so-called common bean, P. vulgaris (cranberry bean, pinto bean, etc.). Runner beans develop large starchy underground tubers and common beans don’t. Another big difference is that runner beans like mild summer temperatures and they won’t set pods in hot climates, but you will have the attractive vines and flowers. To get pods they should be protected from the hottest afternoon sun where summer temperatures are very warm. In my zone 9 (USDA scale) climate on the San Francisco Peninsula, they do fine with temperatures in the 70's to 80's (degrees F) with occasional spikes to the 90's as long as I keep them watered and avoid trellising them on a south or west facing wall. There are other varieties of runner beans besides the popular Scarlet Runner: purple, black and white runner beans are also available (the color refers to the seeds, not the flowers, unlike the Scarlet Runner). Runner beans in Nahuatl is “ayocotl” or in Spanish “ayocote“. 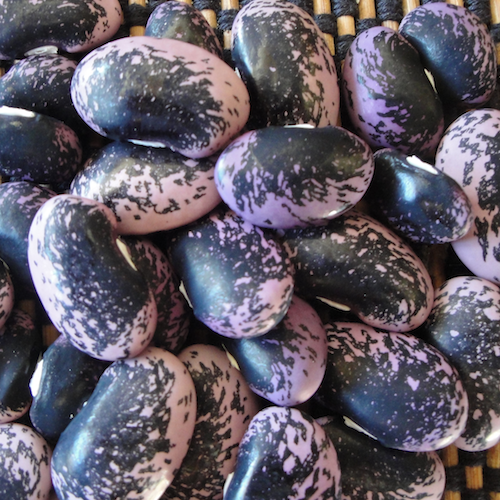 The Ayocote Morado is the purple runner bean. I have grown two different white runner beans, the Italian Butter and Gigante, both from Iacopi Farms in Half Moon Bay, CA. These white beans tend to have large pretty white flowers. Be forewarned that the term "runner bean" is sometimes used for any bean that climbs. In my experience, "runner bean" is usually used for P. coccineus, but remember that it's not reliable. It's alway best to look for the botanical name on a seed packet just to be sure. And although I grow a type of Gigante bean that is clearly P. coccineus, I have seen Gigante listed as P. vulgaris. This just means that somewhere along the way the same common names have been given to different beans- just to keep things interesting! These beans originated in the Americas, and were introduced into Europe from the New World, where other cultivars were developed, such as the Italian Cannellini Runner and the Greek Gigante, the French Flageolet, and many others. They've traveled back to the Americas bringing their culinary histories with them as part of the cultures that have embraced them as their own. Try this test to find out if you have runner bean seeds: sprout the bean in some soil. When a common bean germinates, the cotyledon emerges above the ground (these are embryonic leaves which are the halves of the seed- see photo below) and the true leaves develop afterward. 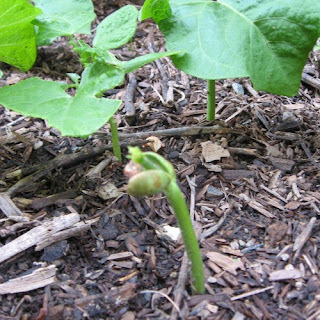 If it’s a runner bean the cotyledon will stay in the ground and the true leaves rise up directly out of the soil. So what are the implications to the gardener? 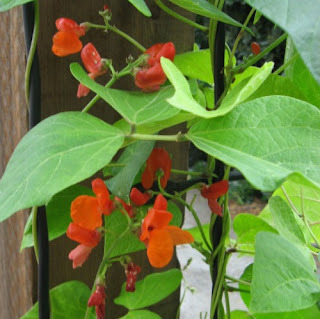 You can plant runner beans in a permanent spot in your garden where they will trellis up 7-10 feet as beautiful lush vines with pretty flowers that attract hummingbirds and bees. When the vines die back with frost, cut them at ground level and just mulch over the roots. They'll emerge again in spring. If you live in an area where the ground freezes in winter, you might try digging up the tubers and storing them somewhere where they won’t freeze, then replant them in early spring. If you want to save the seeds simply let the pods dry on the vine then shell them and store in a dark, cool dry place. Runner beans tend to cross pollinate easily with other runners (P. coccineus), but not with common beans (P. vulgaris), so to save seed that will be true to the type you originally planted, you’ll have to cover them with a protective mesh before the flowers open to keep out aggressive pollinators like bumble bees, that seem to love these flowers. Beans are self pollinating, but to be sure you get pods you can "trip" the flowers by pulling on the lower lip. But if you grow them from the tubers left in the ground this will not be an issue. For an excellent reference on saving seeds from almost any vegetable you can think of, refer to the book Seed to Seed by Suzanne Ashworth, published by Seed Savers Exchange. Besides instructions on seed saving, her book includes descriptions of the botanical families of edibles and which types will cross hybridize, and much more.